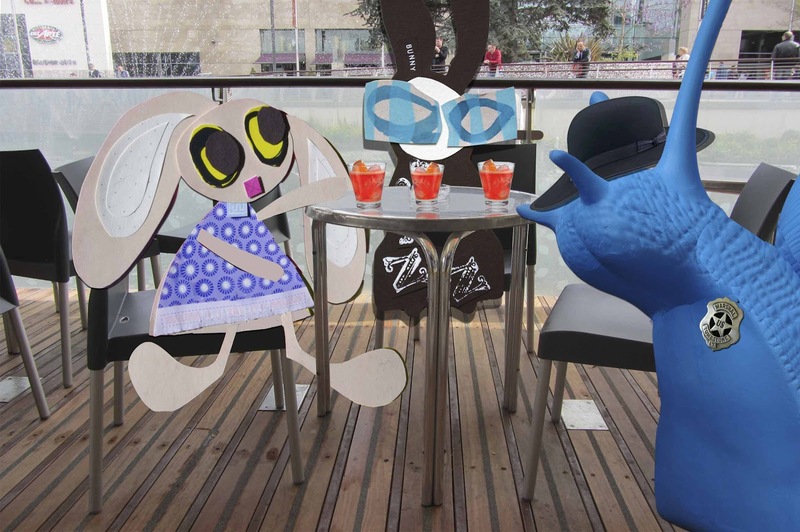 Lovely Lapinette and the Wabbit had ordered three carrot aperitivi because Big Blue Snail was going to drop by for the customary after-adventure meeting. "Howdy folks!" said Snail. "You're new in town ain't ya?" "No we're not," said the Wabbit, "we're very old in town." Lapinette knew Snail wanted to play, so she frowned at the Wabbit and played along. "You've got big broad shoulders Marshall Snail, but it'll take more than shoulders to clean up the town," she said. Suddenly the Wabbit got it and started to drawl. "This is just a dirty little village in the middle of nowhere, Marshall, it don't matter none whether it's clean." Snail snorted and his hat balanced precariously on his antennae. "How does a Snail get to be a Marshall anyhows?" said Lapinette. "A Snail's gotta stop sliding around," said Snail. "A Snail's gotta stay in one place and protect his roots." 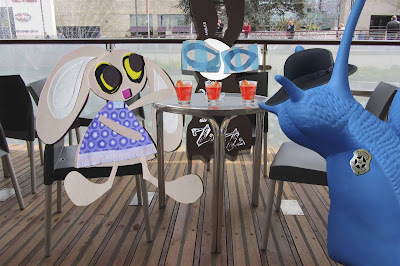 The Wabbit smiled at Snail and turned to Lapinette. "What time is it lady?" he asked. "About ten past three," she replied. "Then where's the three ten to Youghal?" said the Wabbit. "Runnin' late I suppose," said Lapinette. "Silly trains," said the Wabbit, "you can't rely on 'em." By this time Lapinette felt she had more than enough. "I'm not going to ask what kind of adventure it was," she said suddenly. "No," said the Wabbit. "Every time Snail joins an adventure, it's a Western." "Nothing's too good for the Snail that nailed the Skarrots," smiled Lapinette. "You can say that again," said the Wabbit.